S&P Dow Jones Indices today announced the composition and weights for the 2016 S&P GSCI and Dow Jones Commodity Index. The two indices have the same constituents by definition but the weighting methodologies are different. The DJCI is equally weighted with 1/3 of its weight to each sector – energy, metals, and agriculture and livestock, then the constituents inside are liquidity weighted by the 5-year average of the total dollar value traded. The more interesting weighting of the two flagships happens in the world-production weight of the S&P GSCI. This is because the world production is a reflection of the relative significance of each of the constituent commodities to the world economy. Source: S&P Dow Jones Indices. All weights prior to 2015 are actual index weights after the rebalance that may differ from the target weights due to price fluctuations. Notice the Brent significantly caught up to WTI in 2013, but now WTI is set to outweigh Brent in 2016 by even more than in 2013, putting into question Brent’s ability to hold as a real oil benchmark. Although the brent field only produces about 1,000 of 94 million barrels per day, volumes of the contract have more than doubled since 2009 to more than a million contracts per day. 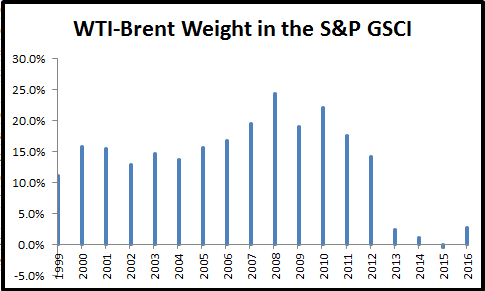 It is this volume (in addition to price) that catapulted brent to compete with WTI as the global heavyweight in the S&P GSCI. The index uses a world production for the entire petroleum component (WTI, Brent, Gasoil, heating Oil and Unleaded Gasoline) then adjusts the individual constituents by a 12 month average of total dollar value traded based on price and volume from the current year’s August through the prior year’s September. 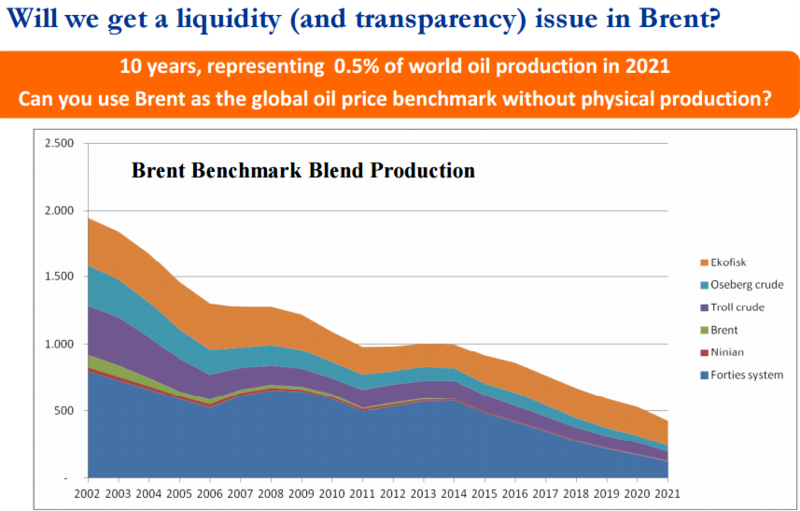 Based on this, the index is now reflecting what the rest of the world already suspects – that is brent is drying up too quickly to remain a global oil benchmark. 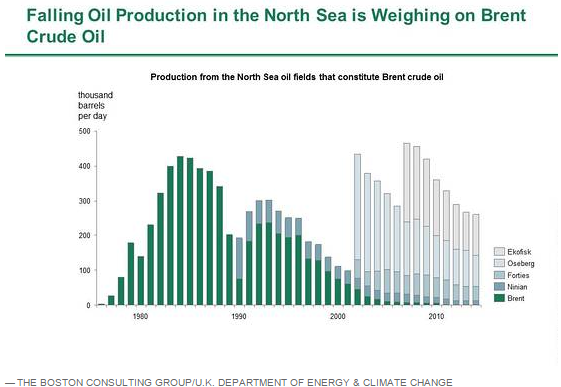 For example, below is a chart from our commodity conference in 2012 questioning the viability of Brent. Source: Wood Mackenzie, Aug 2012. Presented at S&P Dow Jones Commodity Conference. Sept, 2012. Jan-Hein Jesse, JOSCO Energy Finance & Strategy Consultancy. Further, the WSJ reports in this article that changes may need to happen sooner rather than later by adding oil into the benchmark from West Africa, Central Asia or possibly from Brazil. This is because the there is a huge market based on the benchmark pricing where businesses, such as refineries, price the crude they process into gasoline and diesel, influencing prices at the pump. It has a great potential impact. 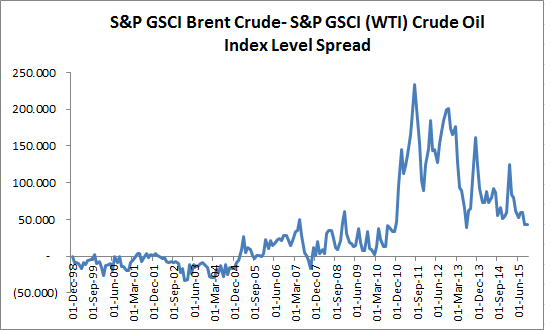 Finally, notice how the spread of WTI to Brent has narrowed. It is hard to argue there is an unfair value. 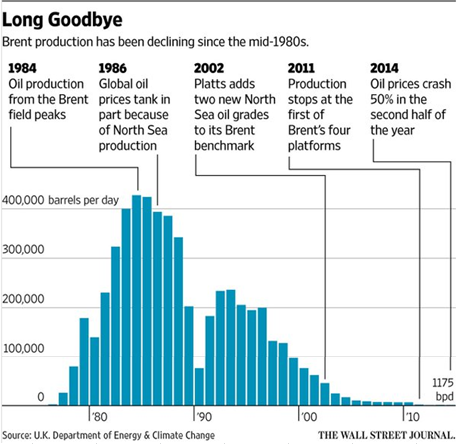 Even if production is rising, the relative volume decline of brent to WTI is the prevailing force of brent’s futility.